Fatherhood makes men fat: New study explains the dad bod. More of Dad to love. Is there any way to put this delicately? Men, when they have children, get fatter. We’ve known this for a while, and now the first nationally representative sample confirms it. 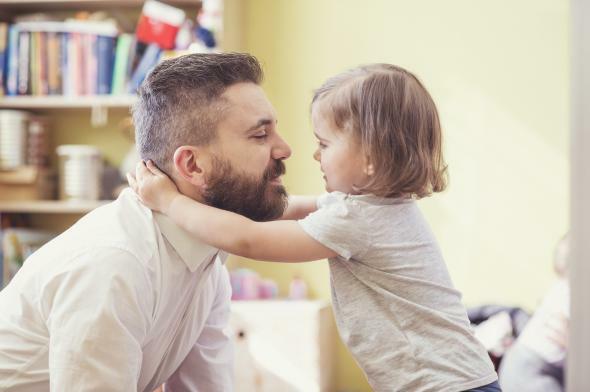 In a study published in the American Journal of Men’s Health, researchers at Northwestern tracked the body mass index of 10,623 fathers and nonfathers over several years. The typical 6-foot-tall man gained an average of 4.4 pounds in the years after having a child; the new dad who did not live with his child gained about 3.3 pounds. During the same age period, the typical childless man lost 1.4 pounds. Thank you, science, for explaining the dad bod. The researchers did not interview any men, but in the press release for the study, they made layman guesses about why fathers gained weight. The men were now busy with babies, so they didn’t have time to themselves. Maybe the dads are on the night shift and wake up with an insane craving for Doritos. (Lead researcher Craig Garfield admitted his personal weakness was eating cheese pizza off his kids’ plates.) Maybe they’re too tired to wear anything but sweatpants, so why bother? Maybe they’re temporarily off the dating market, so why bother? Maybe we don’t need a whole lot of explanation for why an infinitely demanding little being is incompatible with maintaining your fitness routine. The researchers highlighted the study as an opportunity to think about men and obesity. Men often talk about the arrival of children as a chance for self-improvement: a moment when they will quit smoking or exercise more. Instead, their BMI inches up about 2 percent. Since a new father is making regular doctor visits with the baby anyway, the researchers suggest that perhaps the pediatrician should talk to him about his own health and mention the likelihood that his weight will creep up. What’s more interesting to ponder is the politics of this social science. Why, all of a sudden, are we so interested in how fatherhood transforms men? We’ve recently learned that after babies, men—like women—go through hormonal shifts. Their testosterone levels, which are associated with aggression and libido, fall while their prolactin levels, associated with care-taking, rise. We’ve learned that men with children make more money and that they are less depressed. We’ve learned, from a corollary body of work, all about how marriage transforms men: It makes them better employees, richer, happier, and healthier. If they have heart attacks, they are likely to make it to a hospital half an hour sooner, and in general, they’re much less likely to die. They even report more sexual satisfaction (eat it, bachelors). In one sense, feminists should cheer all this new research. It’s long been thought that marriage and childbirth are momentous occasions mostly for women. The man shows up at the altar, and then the hospital, but then generally floats off to work to confront his real identity. The new studies show otherwise: that biology is also preparing their bodies for fatherhood. (One survey showed that men gained 10 pounds while waiting for the baby to arrive). They also show that men in fact are the ones who need marriage, that without it they are floundering and lost. That’s where the politics get tricky. It’s often the pro-marriage crowd picking up on this research. In Slate, for example, researcher Brad Wilcox made the point that men mostly benefit from fatherhood and family if they live with their children, not if they don’t. The new BMI study picks up on this distinction as well, pointing out that while the live-in fathers may have gained more weight, they also tend to be richer and better educated. The subtle message to men is that they are much better off married and living with their children. Proving this with data has taken on some urgency now because fewer men are doing that—in the study, 20 percent of the fathers they tracked were not living with the child at the time of birth. But the subtle message to women is that it’s their duty to civilize the men, to keep them sane and productive and get them to the hospital on time. How long before magazines like Mothering start suggesting five tips to keep your man trim after childbirth?